The maestro, Academy Award two-time winner and five-time nominee, Grammy two-time winner, BAFTA and Golden Globe winner, AR Rahman is celebrating 25, yes 25 years, in the music industry. To celebrate the music, Rahman will be performing at a very special concert in the UK at the SSE Arena Wembley on July 8th! 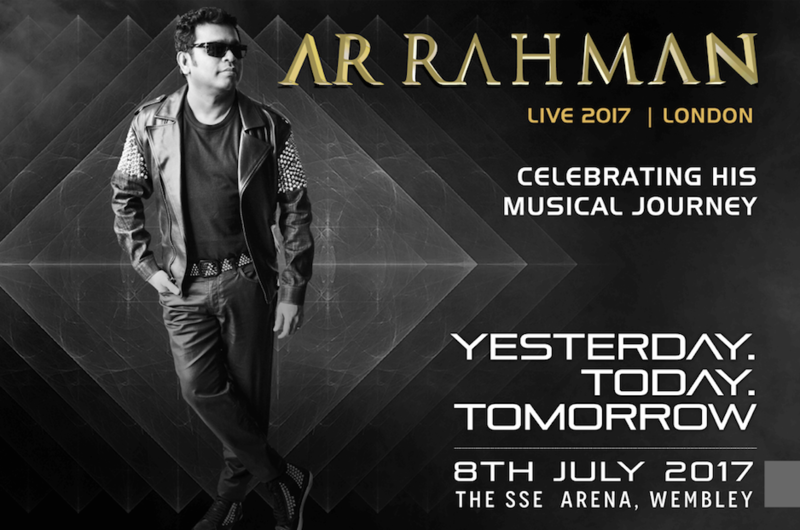 This once in a lifetime experience titled “Yesterday, Today, Tomorrow” will chronicle AR Rahman’s musical journey from his first film Roja to the present compositions and then on to the future works he has in store. The visionary composer will be joined onstage by very special guests including Benny Dayal, Javed Ali, Neeti Mohan, Haricharan, Jonita Gandhi, Ranjit Barot and many more. Just for our UK readers we have a very special contest. You can win a pair of tickets to the concert of 2017. How do you ask? Simple! Tell us your all time favorite AR Rahman song. Email your answer to editors@bollyspice.com. In the subject line please list AR Rahman Concert Contest and you must include your name, address and phone number. Don’t waste any time, we need to award the prize by July 7th, so get your answer in quick! 15 queries in 0.962 seconds.